Improve the health of your gut. Improve the health of your entire body. 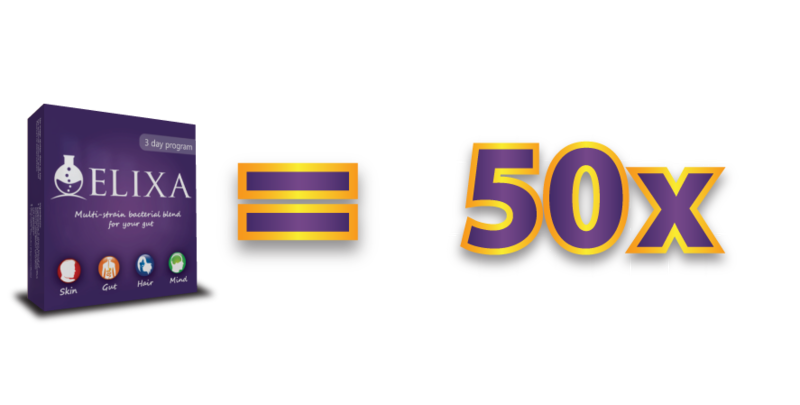 Elixa delivers 50x more beneficial bacteria per dose compared to the average probiotic supplement – Half a Trillion CFUs per dose!  Your digestive tract contains 100 trillion bacteria. That’s over 1 kilogram of bacterial mass living within your gut. When healthy, they provide immense support to our digestive function, immune system, skin health, and mental wellbeing. But an unhealthy gut can result in myriad problems. I tried Elixa to help with some digestive discomfort I’d been experiencing. I was pleasantly surprised to find that it improved my skin too! But what can upset the balance of my gut bacteria? These factors can all decrease numbers of good bacteria in your gut. A combination of antibiotics, processed food, and a modern stressful lifestyle can wreak havoc on your intestinal flora. But there is a solution to an unhealthy gut… and it’s one you’ve already heard of. To restore your gut to optimal health we must reintroduce some of the beneficial strains and species of bacteria that have been reduced in your digestive tract. These are taken as a supplement known as ‘probiotics’. These probiotic bacteria inhabit the gut and keep out non-beneficial microorganisms. 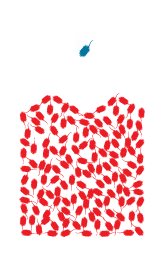 The human gut contains 100 trillion bacteria. 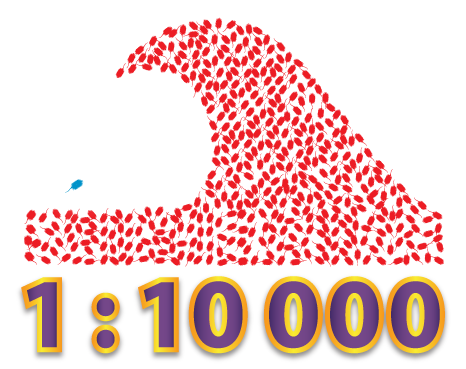 A single capsule or yoghurt drink containing 10 billion bacteria is outmatched 1:10,000 – That’s a drop in a bucket! 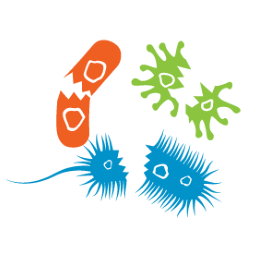 Bacteria are tiny, delicate organisms. They must be grown, freeze-dried, encapsulated, and packaged – All with extreme care. Most supplements fail in one or more of these areas. Countless probiotic supplements contain bacteria and yeasts that are not adapted to reside in the human gut. Cheap bacteria borrowed from the dairy industry is commonplace. Almost all other probiotic supplements recommend taking the product continuously for months on end. This is an impractical and costly treatment strategy.  The theory behind probiotics has always made sense to me. But the problem was, no probiotics ever gave me a benefit in practice. I almost gave up on them entirely! I’m glad I read about Elixa. A probiotic which does justice to the research. So that describes the average, conventional probiotic…. Where does Elixa come in to the picture? With Elixa we’re talking about high-strength, short-course probiotics. 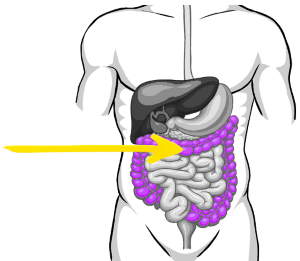 This is where Elixa Probiotic shines. The short-course approach delivers potent amounts of beneficial probiotic bacteria to your gut each day for the duration of the program. So what do we mean when we say ultra high strength? Elixa delivers 50 times the dose of the average probiotic. That’s Half a Trillion CFUs, versus the conventional average probiotic only containing 10 Billion CFUs. Why is that dose superior? As you’ve already learned, the average probiotic is outmatched by a ratio of 1 : 10,000 when compared to the total number of microorganisms residing in our gut. That’s a drop in the ocean! And if you want more than a drop – Elixa is your answer. With a strength of half a trillion CFUs (that’s 500 Billion! ), this is an entire probiotic army. 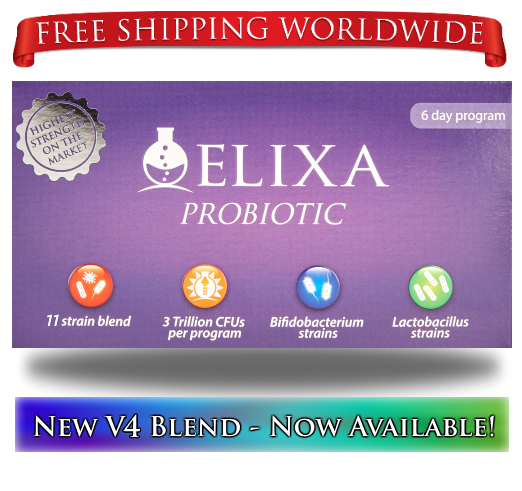 The beneficial bacteria will get to work within 3 days of you beginning your Elixa program. 1) First they will enter your large intestine and find a suitable space to inhabit. 2) Next they will begin to grow in numbers and occupy more and more space on your gut wall. 3) Thirdly, they will start to produce beneficial substances for your gut and reduce numbers of bad bacteria by creating natural chemicals toxic to these pathogens. How is this new form of probiotic now possible? Since starting Elixa I feel a huge lift in my mood. I’m positive and upbeat now. This change was even more welcome to me than the removal of my bloating. It’s been a long time since a product has matched my expectations, nevermind exceeded them like this! Over the first 72 hours you will experience a total shift in your gut health. The main advantage of Elixa (and the true test of how effective it is at targetting the underlying cause) is that once you achieve relief (by transforming the health of your gut rather than using medicines to mask individual symptoms) the results will maintain themselves. We recommend starting with the single pack if you’re new to probiotics. 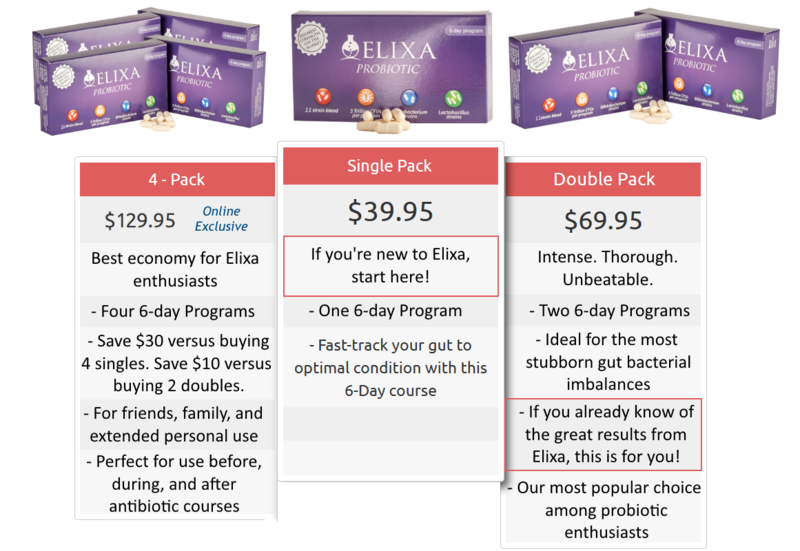 If you’re already knowledgeable about probiotics and know that Elixa is right for you, we recommend the double pack! 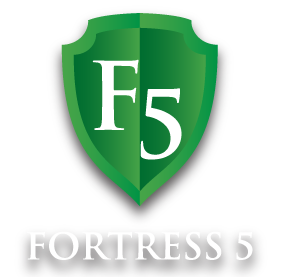 For those of you on antibiotics or suffering from severe gut dysbiosis, you can check out our 4-pack.  All the probiotic strains that we use are adapted to live in the human large intestine and maintain themselves once a sufficient population has been established. People all around the world benefit from Elixa. From Canada to Australia, from the U.S.A. to Asia, from Europe to Africa. We want everyone to have the opportunity to improve their health.  That’s why we charge zero shipping costs for any order size, to any destination. 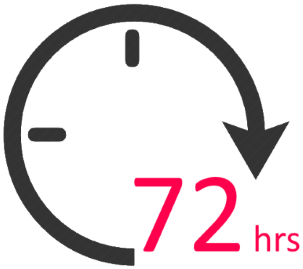 All overseas orders are despatched by rapid airmail to get your Elixa to you as fast as possible. Elixa is a 6 day program of high strength probiotics to help you achieve optimal gut health. Inside each box are 6 sachets, each containing one daily dose of 500 Billion CFUs. This daily dose consists of 10 easy-to-swallow capsules. All you need to do is take one daily dose in the morning, on an empty stomach, for 6 consecutive days! Be sure to wash them down with plenty of water or juice. For people who are serious about achieving the highest levels of gut health as rapidly as possible, we recommend the double pack – taken over 12 consecutive days. After your course is complete you can sit back and enjoy the benefits of a healthy gut. No need to be taking supplements every day for months on end! We recommend repeating the program whenever you feel like your healthy bacteria may be in need of a top-up! For example – during and after antibiotic usage, during and after a stomach bug, and after any excessive consumption of alcohol or junk food. We always recommend first-time users of Elixa to take their 6-day program over 6 consecutive days, without breaks in the program. 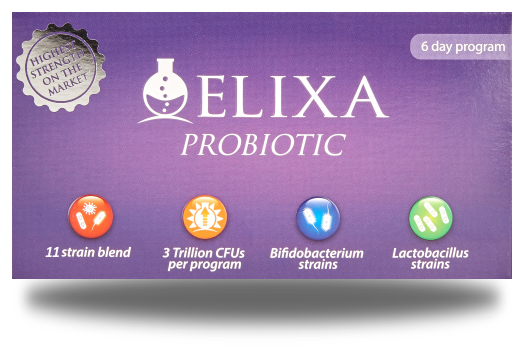 If you wish to take probiotics on a regular basis then there is no harm in taking Elixa as frequently as you desire. Once every month or two is a good aim, for those who wish to continue taking probiotics regularly. Some customers choose to take multiple programs in the first month if they feel they need to correct a more serious gut bacteria imbalance to begin with. And remember – The health of your gut can affect the health of your entire body! Elixa capsules only have three ingredients!  The potato starch is present to provide the benefits of resistant starch with regards to probiotic adhesion and to keep the capsule contents completely dry from atmospheric moisture, ensuring that the bacteria remain in their stable, freeze-dried state until consumption. The magnesium stearate is present in a minuscule amount – less than 1%, i.e. a tiny speck of powder in the final blend – to aid the movement of the probiotic powder through the stainless steel blending and capsule filling equipment.  The capsules are vegetable-capsules made from hypromellose. 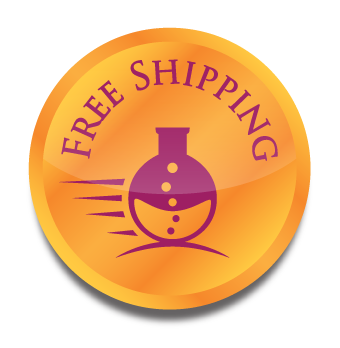 We ship worldwide…. for free! Please note that these times are only approximate and vary based on the efficiency of your country’s customs and postal service once it reaches your mainland.  All post outside the UK is sent by air to reach you as soon as possible. Elixa is completely stable at room temperature for many months, therefore, there will be no loss of quality for any location or transit time. United Arab Emirates, Mexico, Chile, Brazil, South Africa, Uruguay. This list is subject to change as our distribution network expands. If you accidentally make a purchase from these countries; don’t worry! We will refund the entire amount immediately.